I couldn’t find any, so I made one. 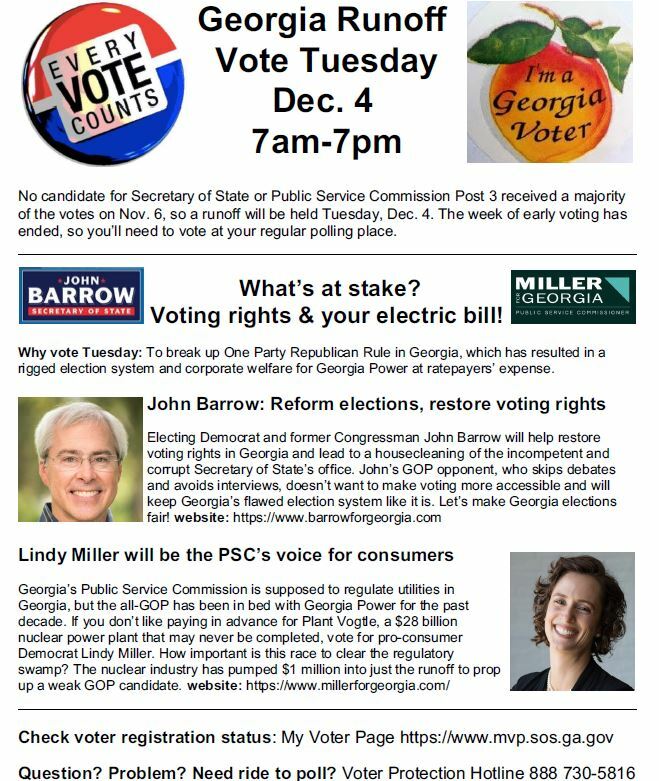 The one I worked up was for Pleasantdale Road precinct in North DeKalb County, but I changed it so it can work anywhere in the state (with 7 am-7pm hours). If you want one with different hours, message me and I’ll make one. By the way, the nuclear power industry can’t stand the thought of an independent voice on the PSC, so it’s pumped (checks notes) a million dollars into the campaign in favor of Republican incumbent Chuck Eaton, who’s made it his business not to do his job for the past 12 years. The difference between John Barrow and Republican Brad Raffensperger is equally stark. Raffensperger chose not to participate in a debate this week and ducked the chance for an interview with the AJC. He’s got an endorsement from Trump (the tweet showed Trump knew nothing about the Georgia Secretary of State’s office) and he’s already posted an invite to his victory party. Hard pass, and I hope it’s sad!